Good things come from bulbs--daffodils, tulips, gladiolas, and lilies are just a few. Spring bulbs might be slow to start for a number of reasons. Your bulbs are just like you they need a good breakfast to get the started. To encourage bulb growth, just whip up this mixture for the bulbs' first meal of the year to be worked into the beds before planting. Turn the soil. Decide what types of bulbs you are planting and where you are going to plant them. Turn up the soil in the area to make it pliable. Don’t do this until you are ready to begin the feeding and planting process. Load the wheelbarrow with compost. Loosen the compost completely so that it pours freely from trowel or hand. Mix in the remaining ingredients. Thoroughly mix in 5 lbs. of bone meal, 5 lbs. of blood meal, and 1 lb. of Epsom salts. Work the mixture into the ground before you plant the bulbs. The mixture should cover 100 square feet of soil. If you gardening area is smaller then reduce the amount added to the soil proportionately. 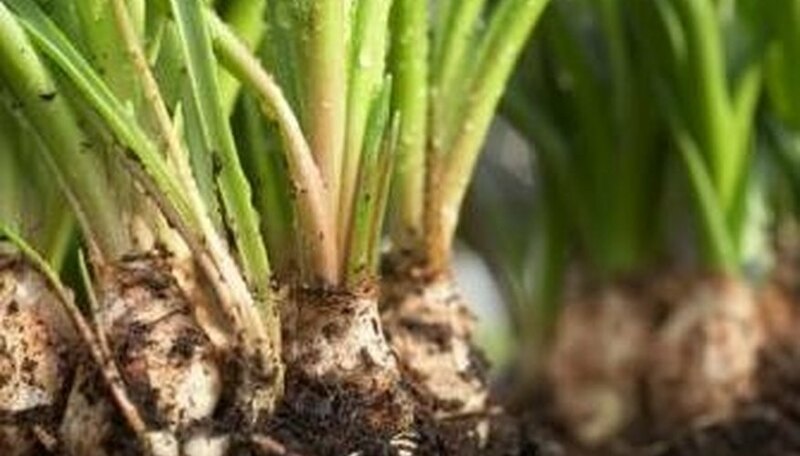 Plant the bulbs, being careful not to plant them upside down or to deep. Water thoroughly. After the initial planting water the bulbs as prescribed by the bulb description. Try it on a smaller scale. Simple mix a handful of the mixture into the soil and work it around single bulbs for smaller planting areas. Plan ahead and make sure that you have all your supplies so that up turned soil is not left to dry out.